NOTE: This article is the first in a two-part series. Be sure to look for Part 2: How to increase employee participation in your commercial recycling program. Plastics are one of the most widely used items (by volume) by businesses in the United States. And, correspondingly, a big component of what is in our landfills. According to the U.S. Environmental Protection Agency (EPA), plastics comprise 12% of municipal solid waste (approximately 30 million tons), with containers and packaging making up the largest part of that percentage. This is up from less than 1% in 1960. The overall recycling rate of various plastic items is slight. The EPA reports that only 9.5% of plastic material was recycled in 2014 with another 15% combusted for energy. This means that 75.5% was sent to our landfills where plastics take 500 years to decompose. And this makes plastics one of the largest opportunities for workplaces to reduce their carbon footprint by creating and maintaining a recycling program. It also saves companies money by decreasing their cost for solid waste disposal. As a result of our recycling efforts, Reitmeier was able to significantly reduce our commercial garbage collection costs. We are committed to continuing to decrease our waste sent to landfills, with the ultimate goal of becoming a zero-waste organization. We are located in Tualatin, Oregon. In the nearby Portland metro and its surrounding areas, businesses are allowed to get large recycling dumpsters where they can place mixed-use recycling items. If you are a business in this area, you can find out more information at Oregon Metro Recycling and Washington County Recycling. If you are reading this and are in a different location, look up your local waste management to see what offer for commercial recycling. Plastic is a broad term, used to describe a wide number of synthetic or semi-synthetic organics. Unfortunately, not all plastics are easily recycled and some cannot be reused or repurposed. Many cities and counties require that plastics be sorted according to its specific chemical composition, or polymer type. To make it easier to separate, plastic manufacturers have applied a numeric resin identification coding (RIC) system to facilitate sorting and recycling. There are seven universally-recognized resin grades, with thousands of types of plastic that span these grades. Each type of plastic has a unique combination of dyes and additives that affect the color, texture, strength, shape, flexibility and melting point. The RIC numbers are printed on each piece of plastic inside the familiar “chasing arrows” symbol. The number that appears on each type of plastic allows us to identify the different types and determine whether they are recyclable. PET is one of the most commonly-used plastics in consumer products and is found in most water and beverage bottles, and some packaging. It is also used in food and medicine containers, and condiment bottles. PET plastic is intended for single-use applications – repeated use increases the risk of leaching and bacterial growth. It is difficult to decontaminate. 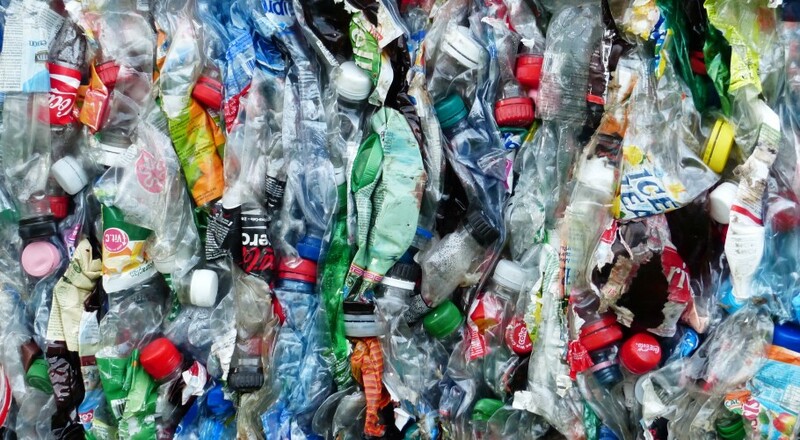 This type of plastic can be recycled and about 30% of PET bottles in the United States are currently being recycled. Recycled PET is made into textiles such as fleece, carpets, stuffing, and similar uses. PET plastics should be recycled but not reused. HDPE is a stiff plastic that is used to make milk and juice bottles, detergent jugs, shampoo containers, toys, and some plastic bags such as cereal box liners. It is considered one of the safest forms of plastics. HDPE is simple and cost-effective to recycle. It’s very long lasting and does not break down under exposure to sunlight or extreme temperatures. As a result, it can be recycled to make into picnic tables, plastic lumber, waste bins, bed liners for trucks, playground equipment, and other products which require durability and resistance to weather. HDPE plastics can be both recycled and reused. PVC is a very flexible, tough plastic that is used to make clear food wrapping, teething rings, children’s and pets’ toys, cooking oil bottles, and many other consumer products. It is also used for plumbing pipes, cable sheathing, window frames, garden hoses, arbors, and trellises. It is fairly resistant to weather damage and sunlight. PVC use has decreased because it is toxic during its entire lifecycle. It cannot easily be recycled in the United States and leaches hazardous chemicals including bisphenol A (BPA), phthalates, lead, dioxins, mercury, and cadmium. While a limited number of PVC products can be repurposed, they should not be reused for applications with food, children, or pets. LDPE is considered less toxic than other plastic and is relatively safe for use. It is often used to make squeezable bottles, stretch film, six-pack rings, tubing, and plastic grocery bags. It is not commonly recycled, although this is changing in many communities as they add programs with the capability of handling LDPE. Plastic shopping bags are not typically picked up curbside, but can often be returned to grocery stores for recycling. Recycled LDPE is used to make plastic lumber, garbage can liners, floor tiles, trash cans, and compost bins. LDPE plastics can be reused, but cannot always be recycled (depending on your community). Check with your local waste management service to see what they accept. Polypropylene is strong but lightweight and flexible. It has excellent heat-resistant properties and acts as a barrier to moisture, grease, and chemicals. It serves a wide variety of functions in everyday use including pails, bottle lids, yogurt containers, straws, packing tape, cough syrup bottles, and plastic rope. While Polypropylene is recyclable through some curbside recycling programs, unfortunately, only about 3 percent of PP products are currently being recycled in the U.S. Increasingly, more recycling facilities are accepting this plastic, so check with your local program. PP can be recycled to make into battery cases and cable sheaths, brooms and brushes, ice scrapers, oil funnels, bicycle racks, garden rakes, storage bins, and shipping pallets. PP is recyclable and considered safe for reuse. Polystyrene is lightweight, inexpensive, and easily formed. It is a plastic with a wide variety of uses including styrofoam, drinking cups, egg cartons, picnic cutlery, foam packaging, foam insulation, DVD cases, and hangers. Recycling is not widely available for Polystyrene products and most curbside recycling programs will not accept them, which is the reason PS accounts for 35% of U.S. landfill material. Polystyrene can be reused at times for packaging but is best avoided. The number 7 RIC is a catch-all category for many plastics, so there is no standard reuse or recycling protocol. Polycarbonate (PC) is used to make baby bottles, sippy cups, water cooler bottles, and car parts. It is strong, transparent, and easily molded. PC plastic food containers have BPA in them, which leaches from them. This is why PC as a consumer plastic has dropped considerably in recent years – there are health-related concerns associated with BPA. #7 plastics are not for reuse unless they have the PLA composting code on them. When possible it is best to avoid #7 plastics, especially for children’s food. Plastics with the recycling labels #1, #2 and #4 on the bottom are safer choices and do not contain BPA. Plastics should be sorted by their chemical structure or resin – use the RIC number to help you. While some recycling programs allow you to comingle your recyclables, others are very strict – or you may have to take them to different locations. Each type of plastic has a unique combination of dyes and additives which affect its color, shape, texture, strength, flexibility, and melting point – and for manufacturers looking to use recycled plastic resin to make new products, it is vital for them to have the correct type of plastic. In locations where there is commingled recycling, plastic reclaimers do not rely on the RIC; they use automatic sort systems to identify the resin, ranging from manual sorting and picking of plastic materials to mechanized automation processes that involve shredding, sieving, separation by rates of density i.e. air, liquid, or magnetic, and complex spectrophotometric distribution technologies. At Reitmeier, we return our water and pop bottles to Bottle Drop. The rest of the plastics that our recycling facility accepts goes into a multi-use container. For materials that they do not accept – plastics such as plastic wrap, plastic clamshell containers, plastic cups, and some rigid plastics, we have to put in our garbage dumpster. We are actively looking for alternative solutions to our plastic recycling efforts and working to minimize our use of plastics altogether – our ultimate vision is to be a zero-waste facility. Want to see what we’ve done at Reitmeier? We love to give tours of our facility and show how we are moving toward a zero-waste company. Call us: 503-603-0205.